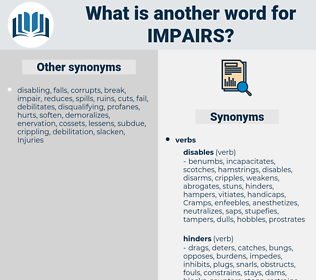 What is another word for impairs? impediments, barriers, Prejudices, Dreams, lesions, mists, counterfeits, obstacles, Injuries, hazards, dangers, outrages, impedes, damages. 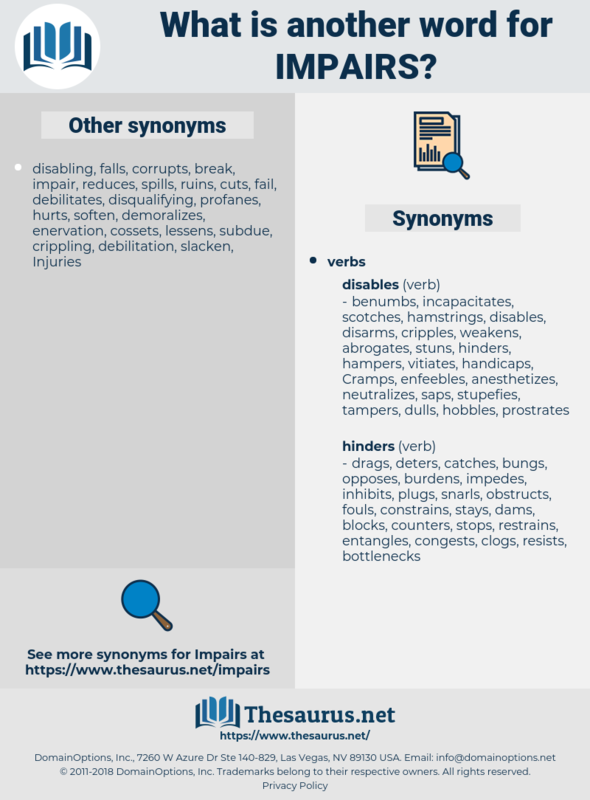 impede, jeopardizes, jeopardises, IMPACTS, endangers, deteriorates, disrupts, impinges, complicates, hinder, hinders, prejudice, degrades, frustrates, diminishes, destabilizes, threatens, infringements, constrains, permeates, interferes, Affects, Obstructing, contradicts, deprives, worsens, mitigates, contravenes, discourages, circumscribes, depresses, curtails, distorts, precludes, restricts, detracts, infringes, erodes, prohibits, weakens, pertains, injures, restrains, inhibits, afflicts, hurts, decreases, interference, Violates, contributes, stops, minimizes, alleviates, minimises, retards, suppresses, decrements, encroaches, eliminates, influences, relieves, shortens, handicaps, undercuts, compromises, lessens, prevents, destruction, deters, destroys, shrinks, desensitizes, suffers, thwarts, poses, reduced, reduces, stymies, limit, limits, breaches, offends, flickers, dilutes, sabotages, obfuscates, deadens, collapses, avoids, lowers, renders, assures, demolishes, Narrows, plagues, confines, allocates, drops, fetters, brings, declines, relates, harms, matches, Slows, hits, Denies, confronts, defeats, Strikes, touches, devotes, falls, puts, decays, thins, Prejudices, Dreams, makes, cuts, impedes, obstructs, damages. Such antagonism impairs the usefulness of their works, and is an offence against public morals, public security, and man's aesthetic nature and psychic advancement. I hear again and again from intellectual persons the complaint that the effort to follow your meaning is too great, and impairs both the pleasure and profit of listening to you.